Excellent for small and medium-sized businesses looking for a web-based HRMS that also includes Applicant Tracking System capabilities. BambooHR is a popular option for small or medium-size companies that are looking to improve and automate their HR systems. The software includes all of the functionality you'd expect from a standard HRMS, and brings all of your HR information together into one central system. It also includes some less common features, such as an Applicant Tracking System (ATS), as well as paperless employee onboarding capabilities, which further contribute to making BambooHR an attractive option for small and medium-sized businesses that need to streamline their HR processes. Per-employee pricing available, with a minimum cost of $99/month. Expect to pay about $7/employee per month, with additional fees for certain modules, such as Performance Reviews. Consult BambooHR for a personalized quote. Is BambooHR the right software for you? Founded in 2008, BambooHR is an HRMS SaaS company that is designed to help small and medium-sized businesses streamline their HR-related workflows. Companies use this service to manage and track their human resources through one integrated system, rather than having to sift through cumbersome spreadsheets or paper. From job postings and applicant tracking, to onboarding and managing employee time off, BambooHR serves as one central system that helps streamline all HR-related tasks. Since BambooHR is 100% web-based, it's accessible from anywhere you have an Internet connection. This freedom, along with BambooHR’s support for multiple languages, allows the company to serve clients around the world. BambooHR currently serves more than 9,000 businesses, which accounts for 750,000+ employees, making it one of the most popular options for SMBs on the market. Although BambooHR's price is a bit higher relative to other web-based systems on the market, it's important to note that it's one of the few systems that includes ATS capabilities. Though these capabilities are less robust than dedicated ATS systems such as Greenhouse.io or Lever, BambooHR may be able to prevent the need to purchase an additional ATS, which can result in substantial savings. Below, we'll discuss the key features of BambooHR, and how they can benefit your business. By aggregating all of your information management tools in one fully integrated system, BambooHR helps streamline routine administrative tasks and leaves you with more time to devote to higher-level strategic work. 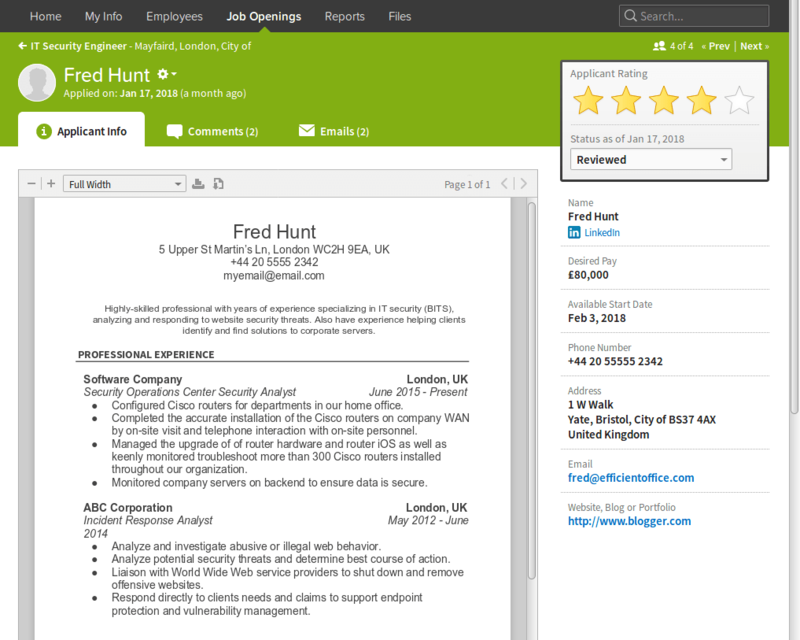 BambooHR stores all of your company's HR data in one secure database. 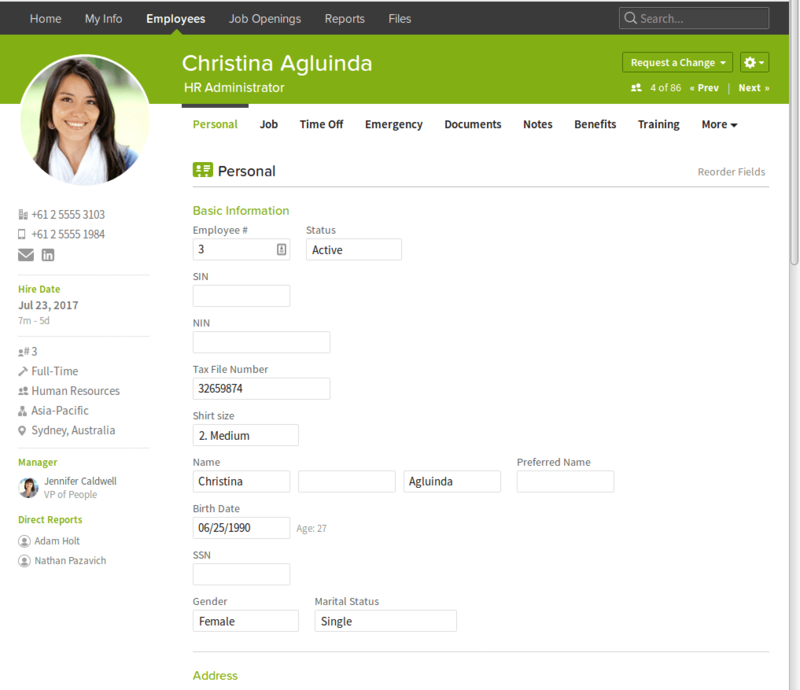 You can create custom fields to track any unique information your organization requires, and also maintain HR data on both current and former employees. This makes it easy to recover salary histories or past job titles as needed. In BambooHR, you can easily access all of your benefits packages and groups for ease of management. The system can also track ACA information and generate the necessary reports to ensure that you're compliant. To streamline workflows, BambooHR includes several pre-made approval processes, and allows you to create custom processes to meet the unique needs of your organization. Customizable access levels give you control over who can see and approve various requests. According to BambooHR, “HR spends an average of 17 hours a week creating reports.” To address this problem, BambooHR is designed to help users save time with several built-in reports that can easily be generated. You can also create any custom reports as needed. 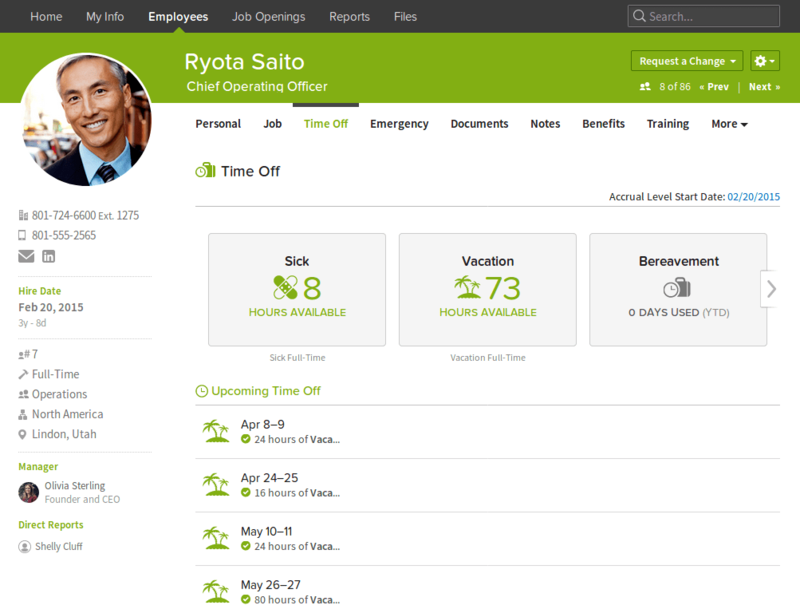 BambooHR's employee self-service capabilities help save HR staff time by enabling employees to perform various administrative tasks on their own, such as changing their marital status in the system, seeing how many hours of vacation they have accrued, and submitting vacation requests. Employees can use the desktop or mobile app to handle these tasks, as long as they're connected to the Internet. When an employee performs an action in the system, BambooHR can automatically notify the relevant manager, or trigger your custom approval process. Since requesting time off is one of the most commonly used employee self-service features, BambooHR has put in substantial effort to streamline that process. The system has a built-in company calendar, which makes it easy to see who is out of the office on any given day. There’s also a built-in vacation accrual calendar, so an employee can see at a glance how much vacation time they will have by a particular date. One way that BambooHR stands out from its competition is by coming equipped with applicant tracking capabilities, which can replace the need for a dedicated ATS. BambooHR's ATS capabilities enable you to easily manage job postings and candidate information from one central location. For example, when communicating with applicants, the system makes it easy to communicate with several candidates at once, by including customizable email templates. When it's time to make an offer, you can use customizable job offer templates to get the offers out more quickly than your competitors. The system also enables you to create and manage mobile-friendly job postings. During the interview process, interviewers can access all candidate information, including resumes, cover letters, and feedback from other interviewers, directly from the candidate's profile. You can also include the candidate's LinkedIn and/or Twitter account in their profile, so that interviewers can quickly get a complete picture of the candidate. This not only saves time but also prevents the need to track this data in spreadsheets or emails, which can help play an important role in ensuring that qualified candidates don't slip through the cracks and get lost in the system. Note that if you already have a dedicated ATS that you're satisfied with, BambooHR is able to integrate with many of the most popular systems, including Greenhouse.io, Lever, Workable and Jobvite. These integrations make it so that when a candidate is hired through one of these other platforms, the data will automatically be imported into BambooHR. Though a dedicated ATS will not be necessary for BambooHR users, if you already have a system that you're satisfied with, you can continue to use it while using BambooHR—many BambooHR users choose to use the system in conjunction with other popular ATS's like Greenhouse.io. Once you hire a candidate, BambooHR can help to ensure that the onboarding process goes smoothly. New hires can fill out paperwork electronically even before their start date, and these documents will persist in the system so that they can be retrieved at a later time if necessary. BambooHR can automatically send notifications once the paperwork is completed, so you can easily keep track of the status of each new hire's tasks. You can also create and assign onboarding tasks for each new hire or to other employees, so that you can be sure specific tasks get handled. For example, you can create a task to set up a laptop for the new hire, and assign it to your IT support team. You can also create a task to ensure that the team takes out the new hire for lunch on their first day, and makes the necessary introductions to the office. By creating these onboarding tasks for each new hire, you can ensure that each new hire has a smooth onboarding process, and that their onboarding process is as standardized as possible. BambooHR offers a performance review module, which can be purchased as an add-on option. The performance module helps managers collect employee feedback quickly and objectively by providing simple questionnaires that are easy to answer. This enables managers to give accurate 360-degree feedback frequently, rather than just at the end of the year. BambooHR can also send automatic reminders and emails to peer reviewers to remind them that they need to provide peer feedback for their colleagues. The system is able to aggregate information across teams and organizations, so that executives can identify high-performing teams, and get a pulse of employee satisfaction. This can help leadership identify issues that are impacting the company as a whole, so that leaders can come up with processes and solutions that will help improve overall job satisfaction. In early 2017, BambooHR launched its new payroll product, Bamboo Payroll, which is a separate payroll service available only to the 50 U.S. states. This service integrates with BambooHR, and can be purchased as an add-on. However, since this product is less mature than the core BambooHR product, it's still being developed and is not as highly regarded as the core BambooHR product. For this reason, we'd recommend waiting until Bamboo Payroll is more mature and has gained wider adoption, since it can be a huge headache for your business if you run into any issues for something as critical as payroll. BambooHR integrates with several popular products that you may already use in your business, to make your HR department even more productive. 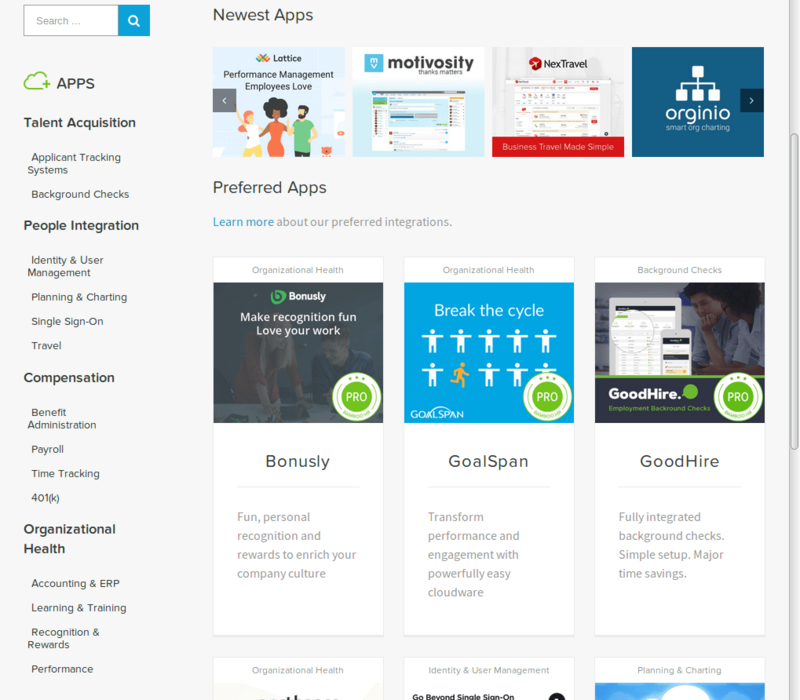 The available integrations run the gamut, from a Single Sign-On (SSO) portal, to integrated background checks of candidates, to employee recognition and rewards. To help you find integrations that suit your needs, you can search the BambooHR Marketplace by functionality, business size, and type of integration (one-way or two-way sync). BambooHR provides an integrated HR solution for thousands of companies around the world. By gathering all of your HR data in one place, and automating many of the tasks associated with managing that data, BambooHR can save HR departments both time and energy. And, since the system is 100% web-based, it can be accessed from anywhere you have an Internet connection. Businesses that are very price-sensitive might prefer a service that has fewer features but a lower per-seat price. However, since the system includes ATS functionality, you may ultimately save on costs, since you won't need to purchase a dedicated ATS for your business. Overall, BambooHR is one of the top options on the market for small and medium-sized businesses looking for an HRMS. To learn more about BambooHR, you can visit their website here.